As I explained in this LinkedIn Pulse article entitled “Inspiring: Social Enterprise in Galway 2016”, I am involved in delivering a new ‘Start a Social Enterprise’ programme on behalf of SCCUL Enterprises and Galway City Partnership – first quarter of 2016 . Workshop 2 addressed business planning. Before the programme commenced, I was wondering whether the ‘Business Model Canvas’ was an appropriate tool for Social Enterprises. I am happy to report that the answer is a resounding Yes, according to the feedback from participants. I hope this post will now assist you to complete your Business Model Canvas. 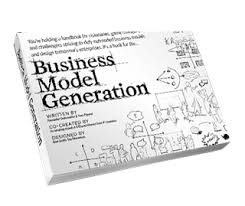 To introduce the tool at the workshop I played this two minute YouTube overview of the Business Model Canvas as created by Strategyzer. They are the organisation who developed the Canvas. I proceeded to explain each of the 9 building blocks so that participants could complete them for their own businesses. CoderDojo seems to be a brilliant example of an organisation that has defined its niche to deliver a social benefit on a mass scale. #.2 Value Propositions – a business seeks to solve customer problems and satisfy customer needs with value propositions. Guest Speaker Anne Walsh of Allergy Lifestyle – your source for EpiPen Case, Medical Jewellery, and Anaphylaxis Kits – explained how she used extensive market to validate the Unique Value Proposition (UVP) of their new product for storing EpiPens. #.3 Channels – value propositions are delivered to customers through communication, distribution and sales channels. Guest Speaker Siobhan Carroll of ACT for Meningitis – the awareness and support charity – explained how they built awareness of their brand. As part of one campaign they used a Beer Mat to communicate the Meningitis message to students in 3rd level. #.4 Customer Relationships are established and maintained with each Customer Segment. The business model configuration determines customer relationship choice. But, I used Sugru Therapy as an example to illustrate that several customer relationship types can be pursued as the business evolves its offering. Sugru specialise in psychological services. They have confidential one to one client engagements; group workshops where people share experiences; and they are now developing an online portal to bring benefits to a mass audience but without the direct personal touch. Many Social Enterprises, such as Vantastic, will have a mix of contributions from Service Users in exchange for specific services allied to contracts from Local Authorities or other public bodies which are often secured following tender. #.6 Key Resources are internal resources required to consistently deliver the Value Proposition? Types of key business activities include: production in manufacturing firms; problem solving in service organisations; and maintaining a Platform in network businesses. I think that Clean Cut Meals in Galway is a brilliant example of how to secure the resources needed to get started followed by brilliant execution – consistent delivery as the business is based on repeat custom. Guest Speaker Lochlann Scott of Helplink – provider of counselling, career coaching and conflict resolution services – explains how partners were critical to scaling their business nationwide. Most Social Enterprises will be value driven with a focus on value creation. You will find other examples of Social Enterprise in Ireland – role models in one sense in my SlideShare presentation entitled ‘What is Social Enterprise: An Irish Perspective’. Hope this post encourages you to complete a Business Model Canvas. 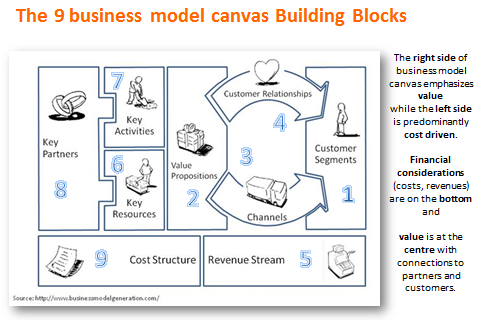 Click here to download Editable MS Word version of the Business Model Canvas. It is a great tool to structure (and test) your business thinking.